Clean water is not a luxury but a necessity. Although the US has one of the safest drinking water systems in the world, pollutants such as heavy metals, pesticides, hormones, and pharmaceuticals occasionally find their way into our drinking water supply. According to the Centers for Disease Control, there are an estimated 4 million cases of waterborne diseases in the US each year. The most frightening thing about this information is the fact that you might be completely unaware of these contaminants in your drinking water. Hence, it is crucial that you use a water purification system to safeguard your family against these potentially life-threatening contaminants. One of the best ways to do this is to install a water purification or filtration system in your house. The average cost of setting up a water purification system in your home is roughly around $1650. As this is an average price, your actual cost may vary depending on a variety of factors like adding additional water treatment and softening options. What are different types of water purification systems? 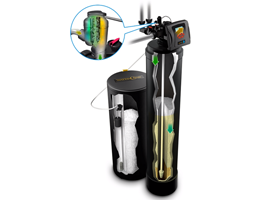 The choice of a water purification system depends on some factors including the contaminants you wish to remove. Simple contaminants such as calcium or magnesium salts or sulfur can be eliminated quite easily. On the other hand, if your tap water contains contaminants such as lead, pesticides or hormones, a more elaborate system is required. The best way to decide which system you need is doing a water quality test. Water Filtration Pros of Texas will test your water for free and provide you with an onsite water analysis. Once you have analyzed your water supply, it is time to decide the filtration system that is best for your needs. But before we jump to it, let’s familiarize us with the types of water purifiers that are available on the market. 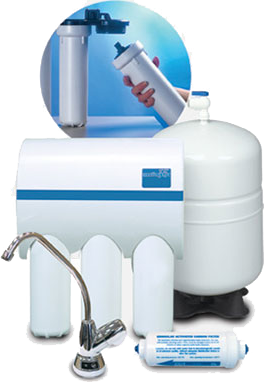 Reverse osmosis or RO for short is a very popular water purification technology. 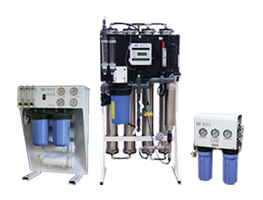 The RO systems can be quite sophisticated with multiple stages of water purification. Many systems even employ a UV decontamination step to destroy any surviving bacteria or other pathogens. At its core, an RO system works on the principle of reverse osmosis, which you probably must have guessed! In a, RO water purification system, water is passed through a series of ‘semi-permeable’ membranes. These membranes have holes that allow only water to pass through along with some dissolved small ions such as sodium and calcium. Large atoms such as heavy metals, hormones, pesticides and pharmaceutical compounds are left behind. One of the biggest advantages of RO purification is the taste. As the RO water retains dissolved oxygen and minerals, it has a better taste compared to distilled water. You can buy RO units in different sizes and capacities. While there are some counter-top systems on the market as well, most popular RO systems are usually faucet based systems. One thing to keep in mind while purchasing RO systems is that most of the systems require professional installation unless you are buying a counter-top version. The semipermeable membrane filters also need to be replaced at regular intervals to ensure proper functioning. Hence, you should think of these recurring costs as well. Although these expenses are not that high, they will be there nonetheless. Distillation is a process of evaporating the dirty, contaminated water and condensing the vapor in the separate place. As you can imagine, distillation is great if your water supply has a lot of dissolved solids in it. As the process is carried out near the boiling point of water, most dissolved impurities can’t evaporate with the water. Hence, after the vapor is condensed, you get mainly contamination-free and pure water. Distillation can remove bacteria and other pathogens, heavy metals and other dissolved solids. The downside of this process is that this process also removes beneficial minerals from the water as well. Also, distilled water can taste quite flat due to the removal of oxygen during the process. There are several types of distillers available for homeowners. Small, countertop versions are, well, small. They can distil and purify only a few gallons of water an hour, and you must refill the system at regular intervals. Although there are some bigger models as well, they too require some form of manual input to operate. The large-scale systems are more complex in functionality and scope as well. These systems are huge and can filter water on a continuous basis. As a matter of fact, most of these systems are hooked right to the incoming water supply to your house. 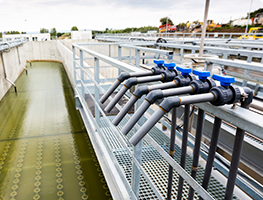 These systems usually employ some different methods to get the water cleaned. Some of the methods used in these systems include the following. Can be quite big and as a result, you will need a professional installation. Although they are not that difficult to maintain, you will need professional help to keep them up and to run in top shape. The biggest advantage of these systems, as you can imagine, is the convenience. Once the system is in place, you get pure, filtered water right from your faucets. As the systems operate ‘in-line,’ there is no need to store the filtered water. Whenever you need purified water, just turn on your faucet. It is as simple as that. These units often come with additional features and some can even operate without electricity. As you can imagine, these units are the most expensive home water purification system. The average cost of water filtration system can range between $1000 to upwards of $10,000. Some factors affect the cost of a water filtration system. Let’s take a look at them one by one. 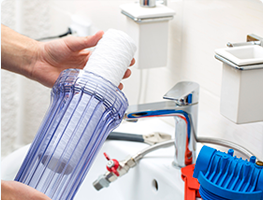 The cost of a filtration system will vary greatly depending on the type of contaminants present in your water supply. For instance, if your water supply is already quite clean, but you just need to get rid of the funky smell or taste, a small tap based system might be enough for you. 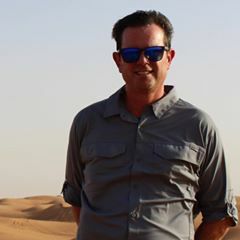 However, if your water supply contains some other impurities such as pesticides or heavy metals, you may require sophisticated filtration units such as Ro or distillation. These units cost a lot more than the simple tap filter. 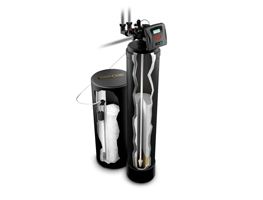 As you can very well imagine, the more water you need to get filtered, the bigger unit you will need. And it goes without saying that larger units cost more. Whether it is distillation unit, an RO unit or a whole house filtration system unit, big units cost more than small ones. Maintainance and running costs can quickly add up. For instance, if you go for an RO based system, you will need professional installation and maintenance which costs money. Also, these systems require their membrane filters replaced after a certain amount of usage. Again, replacement filters cost money, and all this adds up to the expense of the unit itself.